Product code: ES6932 Categories: Art Deco, Art Deco Rings & Art Deco Engagement Rings. 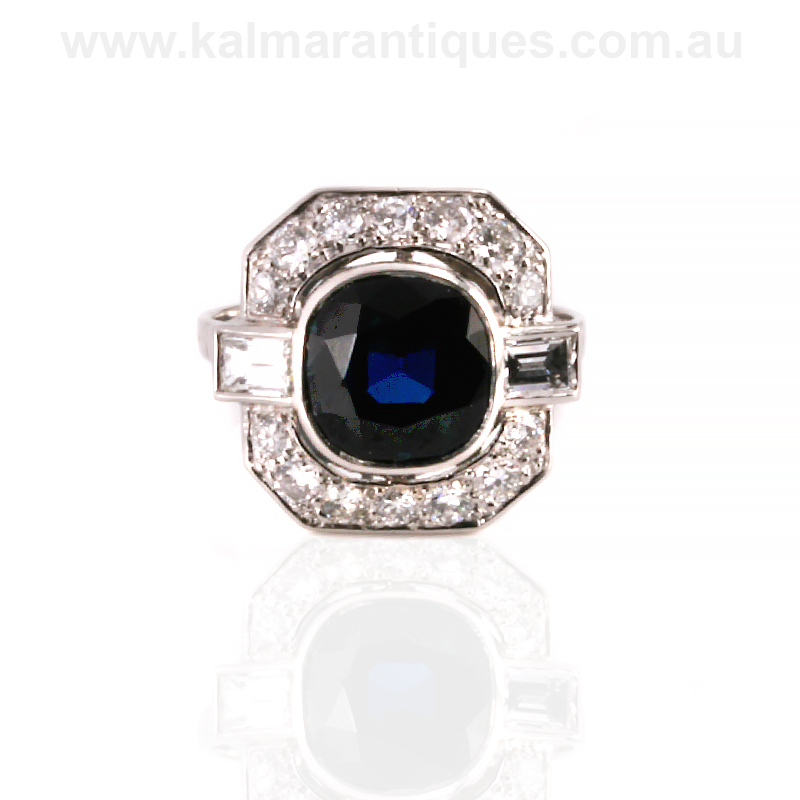 Here is a truly spectacular Art Deco sapphire and diamond ring that was made in France in the 1920’s and looks as incredible in style and design now as it does when it was made nearly 100 years ago. Entirely hand made in platinum, this ring would make an incredible sapphire and diamond engagement ring, anniversary ring or simply for any reason at all. 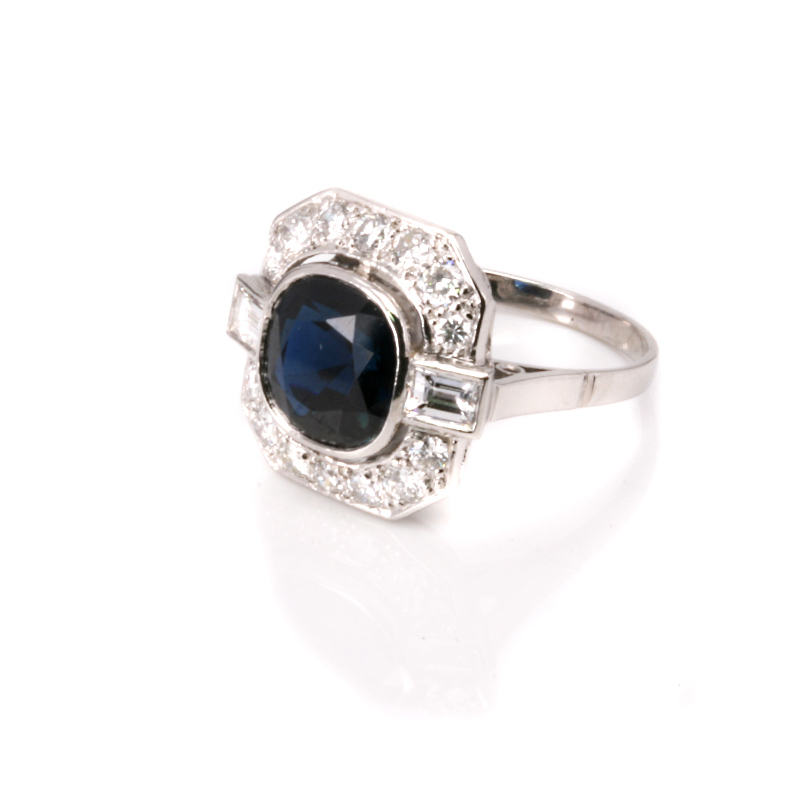 The styling and elegance of this ring is so typical of French Art Deco jewellery of this period and the use of platinum was brilliant in this ring as platinum retains its beautiful pure white colour more than any other metal which works well to compliment the white diamonds and highlight the sapphire in the centre. With the sapphire having a wonderful strong dark royal blue colour, it measures 3.10 carats in size which is just fantastic and so in proportion to the ring as a whole. Then on each side is one baguette cut diamond and around the top and bottom seven European cut diamonds that all combined really accentuate the sapphire. The diamonds total 0.62 carats and are F in colour and Vs/Si in clarity which means that they are lovely and white diamonds with no eye visible inclusions to see with the naked eye which again shows the quality of this ring. Measuring 15.2mm across by 16.1mm, this ring certainly has the proportions to stand out so elegantly on the finger and get the attention it rightly deserves. 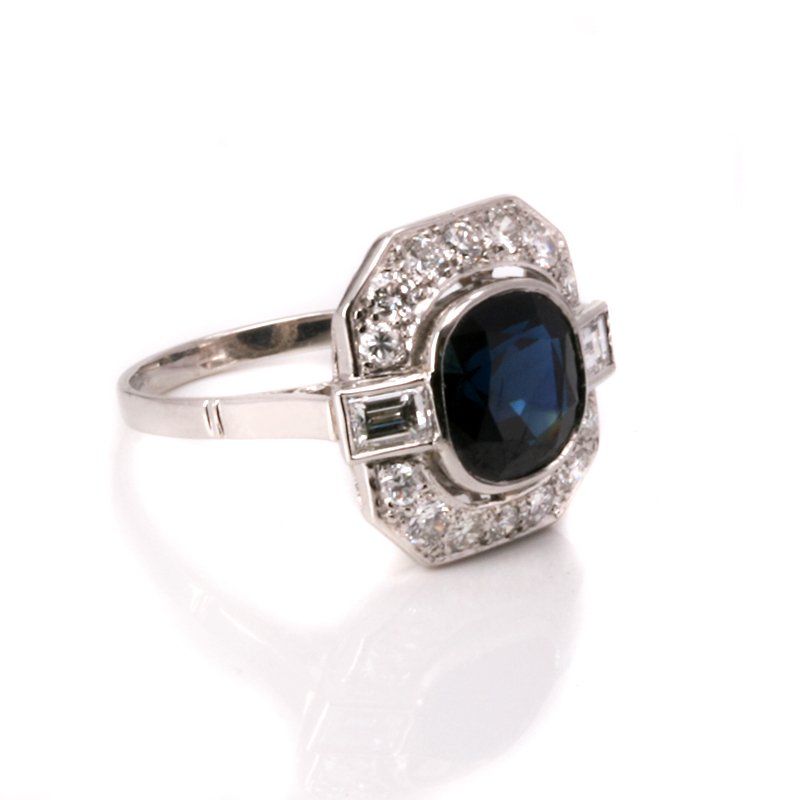 A truly spectacular example of a fine quality Art Deco sapphire and diamond ring made in France in the fabulous 1920’s.